How much energy does that use anyway? 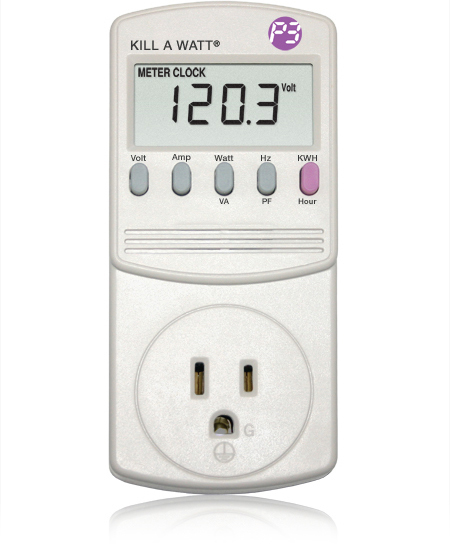 Kill A Watt Meter: The Electricity Detector and Monitor can educate you about your monthly electric bill and help you save a lot of money. You can now be a "detective" and ascertain what appliances are actually worth keeping plugged in. Simply plug in the Kill A Watt Meter, connect your appliances to it, and Kill A Watt will assess how efficient it really is, showing you the instantaneous power used, and also cumulative energy or kilowatt-hours used. Kill A Watt, with its large LCD display, will count consumption by the kilowatt-hour, same as your local utility. With the help of Kill A Watt you can figure out your electrical expenses by the day, week, month, or year on a given device. Kill A Watt can check the quality of your power by monitoring supply Voltage, Line Frequency, and Power Factor. Now you'll know if it is time to install a power strip on your entertainment center instead of feeding those ghosts loads while you are sleeping or away from home. Or, find out how much energy you save with a laptop instead of a desktop computer. We’ve had fun as well as a learning experience with our Kill A Watt meter; last December we purchased some of the extremely efficient LED holiday lights and were positively thrilled at their efficiency. Some of the strands use a total of as little as 2 watts! It’s also useful in checking your frequency (hertz range); if you are burning out lights or appliances, you may have power quality issues and not know it. Power strips are a common occurrence around our home and office; while we do leave the fax and answering machine on 24/7, we use these power strips to kill any unnecessary loads when we leave the room. So we have power strips around all computers and printers, the TV & VCR, and our entertainment center (stereo, tuner, turntable, and CD player). When not in use, all loads are irrevocably turned off. One of the first steps in trying to reduce your energy costs is figuring out where you are spending it. 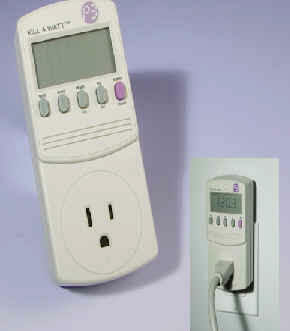 This Kill A Watt Meter is an indispensable tool in figuring out where you are spending your energy dollars. and become your own energy consumption detective. It is the easiest step to take to try and start saving your energy dollars. E-mail us for free information on system sizing; or order our Design Guide & Product Catalog on CD for $10.00. or Fax: 406-777-0830 Oasis Montana Inc.